The hardware design of the TS-2477XU-RP provides exceptional system performance and expandability to fulfill diverse application requirements. Powered by a high-performance AMD Ryzen™ 7 2700, AMD Ryzen™ 5 2600 or AMD Ryzen™ 3 1200 processor with AES-NI encryption acceleration and up to 64GB DDR4 RAM, the TS-2477XU-RP delivers aggressive yet power-smart performance to meet your multitasking demands. For resource-demanding business applications such as VDI, R&D, private cloud, and server virtualization, look no further than the TS-2477XU-RP. The TS-2477XU-RP supports dual-channel DDR-4 memory and four Long-DIMM slots. When using paired memory modules, the TS-2477XU-RP can leverage the power of dual-channel architecture to boost performance. You also customize the memory configuration (supports up to 64GB RAM) of the TS-2477XU-RP, making it the most ideal and cost-efficient storage solution for environments like virtualization that contain dynamically-changing workloads. The TS-2477XU-RP features four PCIe slots* that allow for installing 10GbE/40GbE network cards, QM2 M.2 SSD/10GbE PCIe cards, or compatible wireless network cards for greater application potential. Install QNAP's innovative QM2 card to add M.2 SSD caching or 10GbE (10GBASE-T) connectivity to the NAS to enjoy optimal performance. Install QNAP's wireless network card (QWA-AC2600) to work with WirelessAP Station to transform the NAS into a convenient wireless base station, allowing network resources of the NAS to be shared with multiple devices. Graphics cards are optimized for graphical calculations and transformations, but require significantly more power compared to other hardware. The TS-2477XU-RP offers PCIe slots to support an AMD Radeon™ or NVIDIA® graphics card and features a 500 watt power supply that provides a 8-pin (6+2) power connector and a 6-pin power connector to power a graphics card for boosting imaging processing in QTS and performance of virtual machines via GPU passthrough. 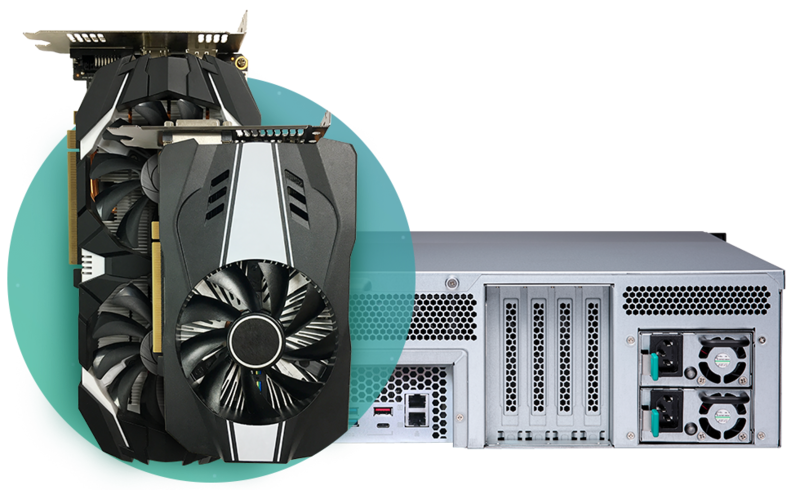 Featuring four PCIe slots, the TS-2477XU-RP allows you to insert up to two high-end graphics cards that work cooperatively to deliver incredible computing performance over a single graphics card. 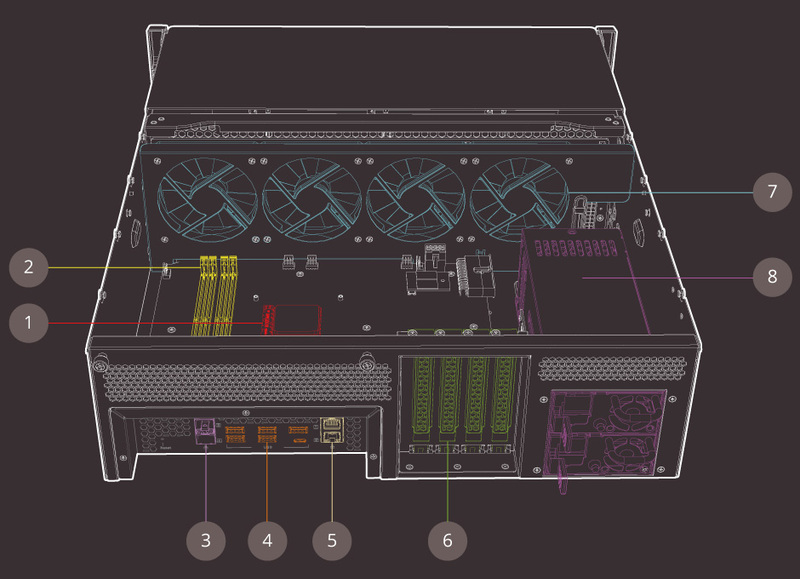 It helps lead to greater potential for accelerating NAS video processing and GPU computing, empowering data-intensive AI machine learning, and realizing GPU-passthrough to VMs. Datasheet for QNAP TS-2477XU-RP is coming soon.